Coventry City Football Club is one of English football’s longest-established teams. The Sky Blues were formed in 1883 and enjoyed their most memorable moment 104 years later when they beat a star-studded Tottenham Hotspur 3-2 in the 1987 FA Cup final. More recently, the club has been making headlines for its commitment to corporate social responsibility. 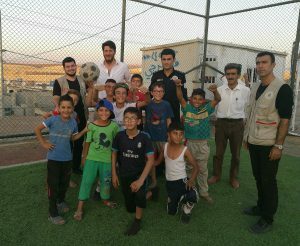 In the course of his business travels, Coventry City chairman Tim Fisher visited a Syrian refugee camp based in Iran and was saddened and challenged by the deprivation of the refugees and their desperate plight. In spite of the upsetting scenes, Tim also recognised the positive impact made by the opening of a five-a-side football pitch that had been installed by the United Nations and was amazed the refugees were even organising their own leagues and competitions. What they lacked was proper football kit and equipment and Tim immediately decided Coventry City would change all of that. Newsline highlighted how the chairman returned to Coventry and requested that all of the Sky Blues’ former kits and training strips be collected and collated. The result was a total of 30 large boxes of Coventry City gear being shipped out to the refugee camp at Darashakran, Iraq. 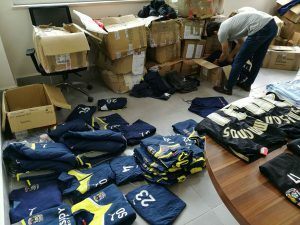 We also covered the presentation and distribution of the kit to the delighted refugees. Newsline’s actions achieved international coverage of the event via the influential BeSoccer website (15 million regular users), national coverage in the UK’s biggest-selling newspaper The Sun, as well as on Sky Sports. There was also regional newspaper coverage in the Midlands. Our work ensured this initiative was widely circulated and appreciated which in the process made it a superb advert for Coventry City, their commitment to corporate social responsibility and the club’s caring, sharing qualities.